Dell, the world's third largest PC maker announced its first quarter earnings, revealing a 33% decline during its conference call with analysts, as reported by Seeking Alpha. The firm blamed slow notebook sales combined with sluggish markets in Europe, Asia and the public sector. Dell's first quarter period ended May 4, with the company's total revenue down 4% year-on-year, to $14.42 billion. This was below Wall Street analysts' predictions of $15 billion. Net income was even worse, with a 33% decline to $635 million, or 36 cents per share. Sales of notebook computers were affected by the push from consumers to tablets, according to Brian Gladden, Dell's chief financial officer. The company's notebook sales were down 10% to $4.24 billion during the quarter. At the same time, its high-end XPS range of notebooks actually grew by 30% but the size of the business was too small to make up the deficit from the rest of the notebook division. Desktop PC sales fared better, with a one percent drop to $3.27 billion during the quarter. The servers and networking division grew by two percent year-on-year, to $2 billion. Storage sales were down by eight percent, however, coming in at $444 million for the period -- although confusingly, the company's own storage solutions which include its PowerVault line rose by 24% during the quarter. "Clearly we are seeing a bit more challenging demand environment," Dell's chief financial officer Brian Gladden said in an interview. "Europe, in general, was down for us." All told, Dell's growing enterprise and solutions division accounted for 31-percent of the firm's total revenue, and 50% of the margins during the Q1 period. 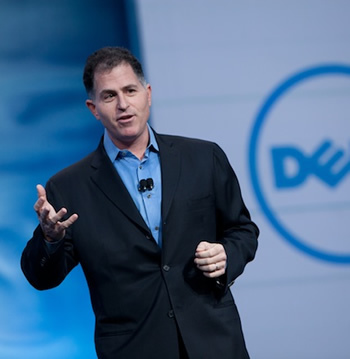 Looking forward, Dell expects its second quarter results to follow historical trends and increase around 2-4%. The computer maker also announced that it will offer a full complement of Windows 8 devices when Microsoft releases its new OS later this year, including tablets, hybrids and ultrabooks as well as notebooks and desktop PCs. Shares dropped to $13.20 in afterhours trading, down from $15.08 upon hearing the news.